I love Friday! I look forward with way too much anticipation to notification of the weekly photo challenge. This week did not disappoint. This week’s photo challenge, “Off-Season” is right up my alley. The husband and I don’t have kids (though we have a lovely selection of nieces and nephews) so we do the bulk of our travel in the off-season, when prices are lower and the kids are in school. We also often plan at least one trip a year in our own great state as there are so many beautiful places we have yet to explore in Washington. 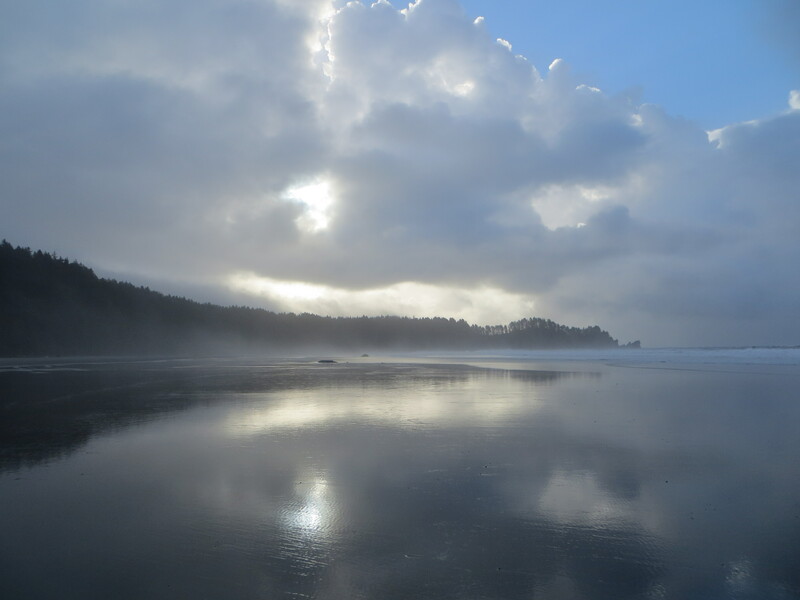 Last October the husband and I spent a week in the LaPush/Forks area. Yes, of vampire fame. What’s interesting is that none of the films were actually filmed there, but that hasn’t kept fans away. LaPush and Forks sit in Northwest Washington. It is a beautiful area and, during the summer, attracts tourists in droves. 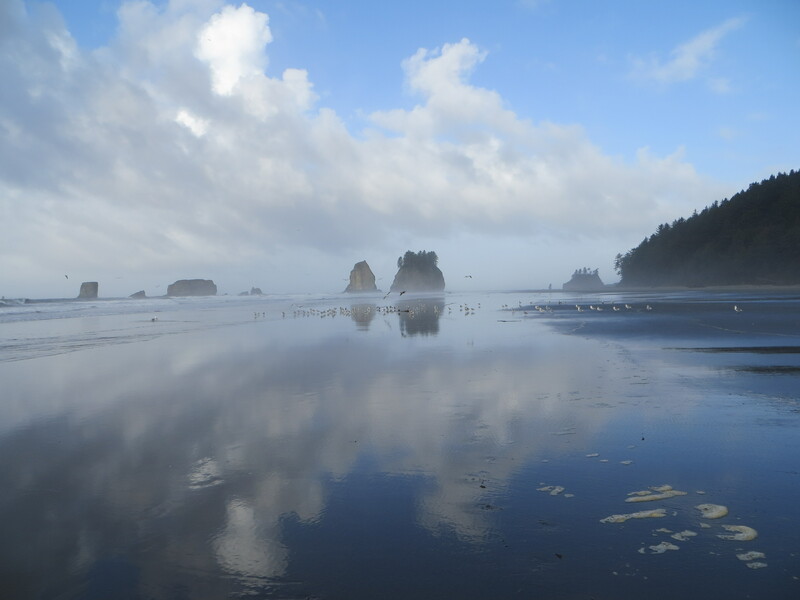 Both for the vampires and the beautiful beaches and proximity to the Hoh Rainforest and Olympic National Park. However, in October the area is….empty. Sometimes almost eerily empty. One morning we awoke and headed for Second Beach. This beach a good mile long with rocks off the shore to make the scenery even more breathtaking. We dodged rain showers that morning and were rewarded with some sunshine. Best of all? We had the beach all to ourselves. I think we saw all of a half dozen other people. And, the sun and clouds made for some breathtaking pictures. Off season….my very favorite season. An incredible capture of the lighting! Thank you very much, Tom! The light was amazing that morning. Thanks! There’s nothing like it! Gorgeous photos, Lanae. That would be my time to visit as well. But vampire fame? What am I missing here? Thanks, Janet! The Twilight series was set in this area. When Borders was still in business and the Twilight craze was in full mania, I went in one day to browse and saw, to my horror, life-sized cardboard “statues” of the characters. Ewwwww. Not so much into the metro-sexual look, even for vampires. Vampires should be bad, not be able to be out during the day, and definitely NOT sparkle!! Totally with you on the off season. Down here in FL, though, the off season is snow bird season–tourists from up North! Not near as bad as summer season! It is a beautiful place…but I don’t know if I would love it as much in the height of summer when it’s crowded with people. We were there on a beautiful August afternoon and could turn in all directions without seeing any people. A happy surprise! A very happy surprise! That was a good August day! Thanks! It’s a favorite of mine as well. Your photos are truly stunning! Second beach is one of our favorites as well. Next time you visit the area you should let me know and maybe we can connect. That would be fantastic! I would love to visit your gardens. I was drooling over your tomatoes this evening. And the never-ending cherries! You’re ambitious! All of that pitting! I just can them, pits and all. Are you on the west side of the peninsula, or the east? Ahhh…you’re a destination. Wish you were closer but, yes, next time we’re headed that direction I’ll let you know. Same goes for if you’re in my neck of the woods.